Of all comparisons between Android smartphones that we do each year, this one is among the most interesting ones, as it pits the best of two of the most prominent rivals on the market against each other. 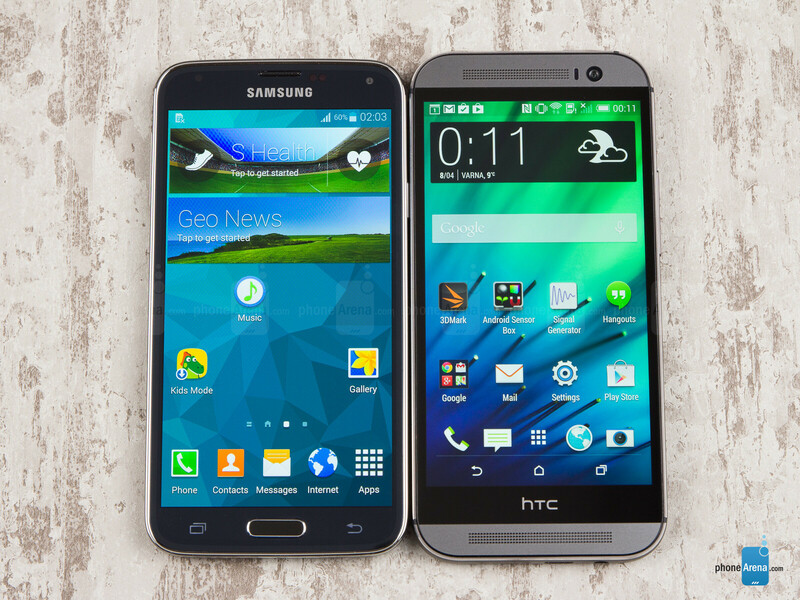 In 2014, we get to compare the newly-launched Samsung Galaxy S5 and HTC One (M8) – two amazing smartphones, both running Android, both relying on completely different approaches to securing a firm and respectable position on this key market. In case you've been following PhoneArena for the past few months, or even years, then you know that there hardly is a bigger rivalry than that between the South Koreans from Samsung and the Taiwanese from HTC. Well, probably except that between Samsung and Apple, but if we limit ourselves to the boundaries of the Android market, then we definitely cannot think of a bigger rivalry. Obviously, both companies have their own arguments in this struggle, with both actually making a good point most of the qtime. For example, Samsung keeps bugging HTC for its sub-par UltraPixel camera, while HTC continues to point at Samsung's overly-plastic phone designs. No matter where you stand with regards to this eternal conflict, we all have to give credit to these two companies for relentlessly trying to keep and improve their leading positions, as well as for crafting some of the most amazing smartphones the world has ever seen. With all of that said, it's time to officially kick-off the competition between this year's contenders – the Galaxy S5 and the One (M8)! Oh boy, we can definitely understand HTC for praising its premium aluminum design, which has become even more attractive in the One (M8). With even more metal and a beautiful gunmetal finish, the HTC One (M8) is certainly a treat for the eyes of smartphone lovers. Meanwhile, the Galaxy S5 remains true to Samsung's idea of an Android smartphone – it comes with the familiar Samsung look, but there's a twist this time around. After the glossy plastic of the GS4 and the faux-leather finish of the Note 3 (and some of the late GS4 variants), Samsung has once again decided it's time for a change, and so the Galaxy S5 comes with the new Glam look, which features a rubbery plastic finish on the back, decorated with an eye-catching, dotted pattern. As a whole, both devices look quite good, with the HTC One (M8) having the more striking and premium appearance of the two. In terms of comfort, however, the GS5 proves to be the better handset, as its rubbery plastic material feels warm and inviting to the touch, whereas the cold and hard surface of the all-metal HTC One just isn't so comfortable to hold. In terms of dimensions, both handsets are quite imposing. 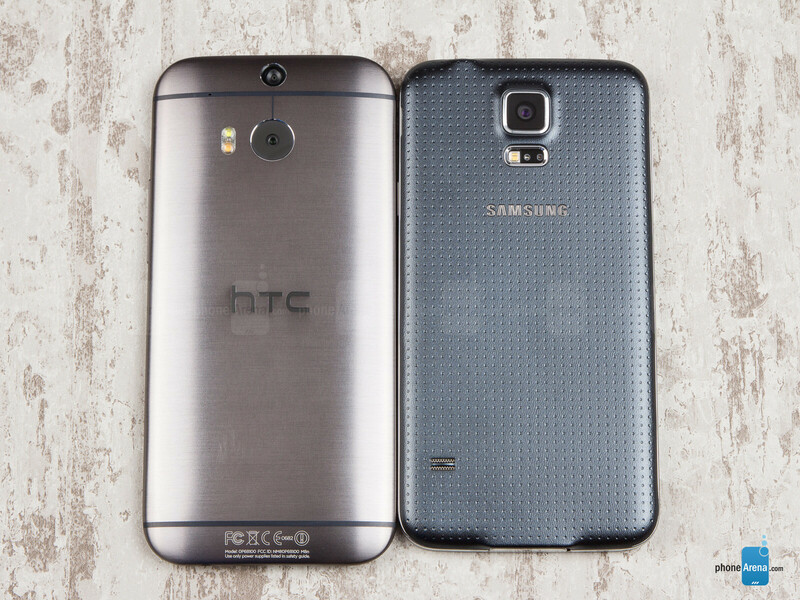 The HTC One (M8) (5.76 x 2.78 x 0.37 inches (146.36 x 70.6 x 9.35)) is a bit taller, but it kind of makes up for it by also being a bit narrower than the Galaxy S5 (5.59 x 2.85 x 0.32 inches (142 x 72.5 x 8.1)). Other than that, the GS5 is a bit slimmer than its opponent. When it comes to weight, these devices are by no means feather-light, but the Samsung Galaxy S5 definitely feels a bit lighter with its 5.11 oz (145 g), compared to the HTC One (M8)'s 5.64 oz (160 g). Both handsets have great physical buttons – all of them are clicky and mostly easy to feel by touch alone. One definite advantage that the Samsung Galaxy S5 has is found with its IP 67 certification. This means that it's completely dust-proof, plus it can also stay water-tight if it's submerged in up to 1 meter of water for up to 30 minutes. Meanwhile, the HTC One (M8) only has IP x3 certification, which means that it's not dust-resistant, and it can only withstand small sprays of water, like rain. Super LCD, or Super AMOLED – that is the question! But regardless of which one you're going to side with, one thing is certain – things are going to look super-cool! Without a doubt, being punchy and extra-vivid is Super AMOLED's specialty. However, the LCD of the One (M8) is also nicely saturated and vibrant, all the while being much more natural-looking. The trouble with the GS5 screen is that it lacks enough red color, resulting in rather cold visuals. The One M8 could be a bit warmer as well, but on the whole, its color balance is much better, delivering a much more realistic image. With its slightly higher maximum brightness, the HTC One (M8) manages to be a bit easier to view outdoors, although the S5 is also pretty decent in this respect. Viewing angles are good on both phones - the GS5 retains its brightness and contrast, but loses some color accuracy, while the One (M8) keeps its colors in check, but loses contrast and brightness. 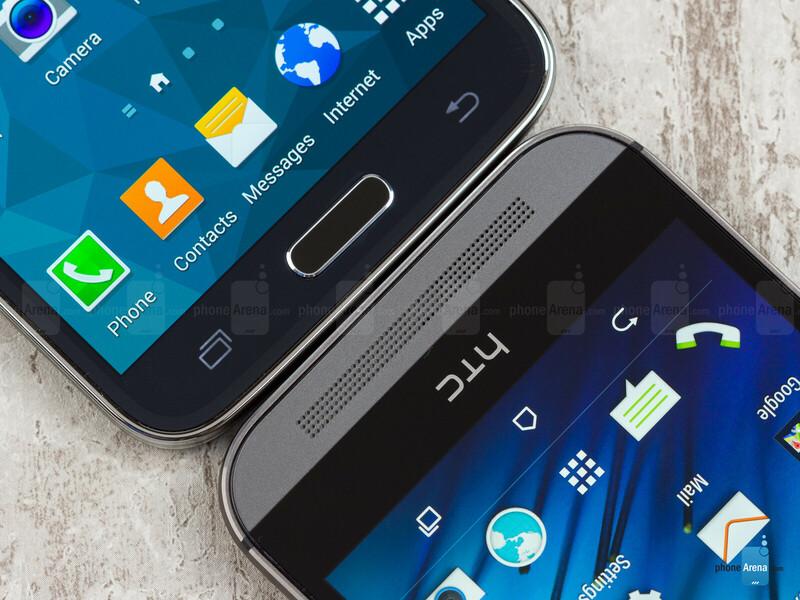 However, the Galaxy S5 does have the upper hand in the minimum brightness area, as its screen has been designed so that its brightness can go as low as 2 nits, enabling a super-comfortable viewing experience in the dark – something that you can't have with the One (M8) and its 16-nit minimum brightness. 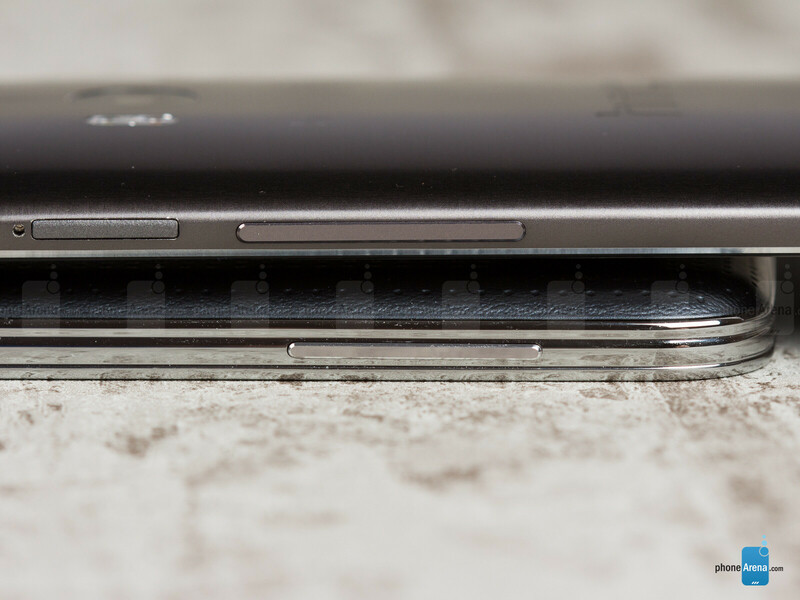 In terms of general specs, the Galaxy S5's screen gets an ever so slightly larger diagonal, at 5.1 inches, while the One (M8) sports a 5” one. 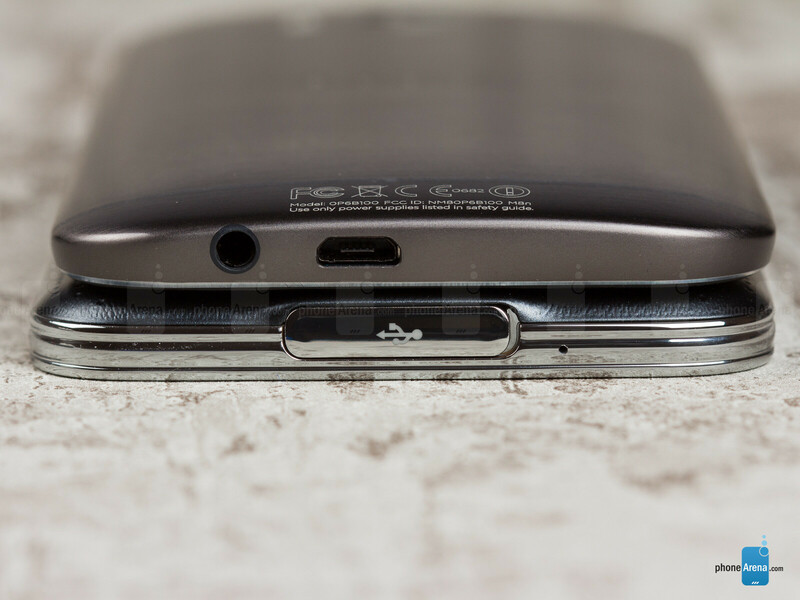 However, viewing area is often significantly bigger with the Galaxy S5, since it doesn't use on-screen navigation buttons, such as those of the One (M8). Resolution-wise, both handsets use 1080 x 1920 pixels, resulting in a 441 ppi density for the M8 and 432 ppi density for the GS5. Even though the One (M8) seems to have a slight advantage in this area, there practically isn't any noticeable difference between the two with regards to picture clarity and level of detail – both are extremely good! agree, good look car with no motor just looks good and that it. But M8 for bezels! lol, just kidding. 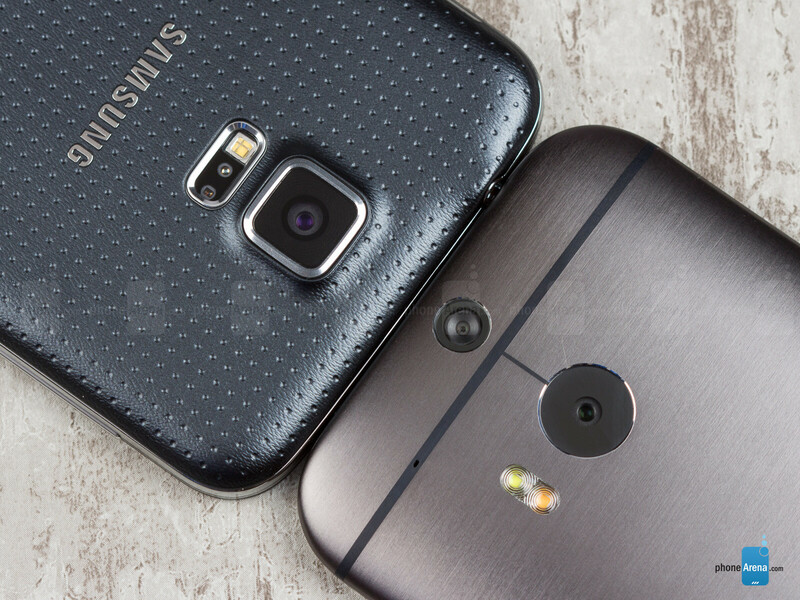 M8 is clearly the winner comparing to S5 It's the best phone on Earth! Htc ONE has been crowned the best pone of the year, two years in the roll.. You can't argue with the experts... this new M8 has out performed s5 in any aspect.. M8 is better than S5. one thing that confuse me who care what the outside of the phone look like. because everybody buys cases for their phone. it is whats on the inside of the phone that counts. Most of these M8 all the way posts are fan boy trolls who trying to irratate serious posters. The S5 is obviously a superior phone period as Obama would say. I'm really surprised at the harsh ratings. 8.9 for m8 ? I wish the Samsung wasn't so set on having their phone be a rusty Swiss army knife.. m8 is consistent, the flash REALLY compensates pitch black scenarios. P.s. do we really expect a game changer? What would be the point in buying more products. Don't expect a well rounded HTC device for sometime( years). More compact body, better screen, IP67 rating, better support from community (like it or not), slightly better processor, faster downloads, less prone to scratches (if you dont like cases). I think the S5 took this one. 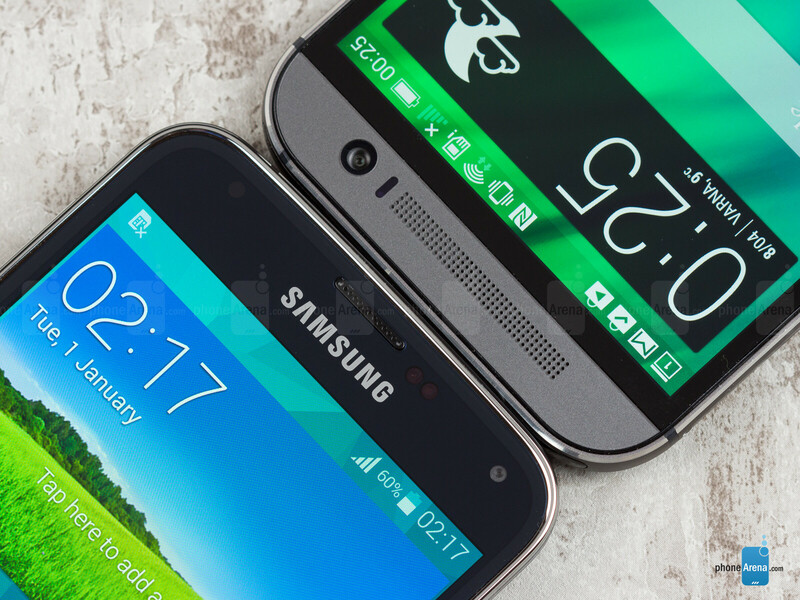 As a phone, in my opinion GS5 is better than M8. But if I had to pick one, I'm not so sure which one I'd choose. Maybe GS5 after all. Do not make your decision based on the tech-site-reviews, though. See, here is not a word, about: “[The Galaxy S5] has a long list of new records for best smartphone display performance including: Highest Brightness, Lowest Reflectance, Highest Color Accuracy, Infinite Contrast Ratio, Highest Contrast Rating in Ambient Light, and smallest Brightness Variation with Viewing Angle,” DisplayMate concludes. “ I stop reading this M8 ad article, then. S5 for everything...I just love it! Phonearena should use "Movie" mode in S5 for display analysis. Various reviews have found that white point in S5 is one of the best. Anandtech found colour temp of 6504k. These guys keep using max brightness for comparison rather than auto brightness. This tells me they obviously don't know the products well enough. If they used auto brightness on the S5 it's much brighter since Samsung went out of their way to implement this feature specifically for sunlight. It's sad because of how much I was looking forward to the M8, but the device is a pretty big disappointment. Whether it's the camera, the overall device size, or the poor use of space, the M8 is just not the step forward it needed to be in order to be competitive. I'm no Samsung fan, but the S5 at least was an overall improvement over the S4. I just can't say the same for the M8. Gs5 wins hands down. Still we will see some 4mp ultrapixel fanboys whining. Uh, until now, I've just seen Samsung fanboys complaining about the camera without own experience. On the other hand people who already own M8 don't complain. "On the other hand people who already own M8 don't complain." You mean- nobody? You know it is available for purchase. Such a bad troll.